MPR: Local band makes music from "found sound"
The Minneapolis band Savage Aural Hotbed creates sounds with strange objects. Very loud sounds. The band uses "found instruments." Instead of playing guitars or pianos, band members thump on things like domestic appliances and oil drums. They've invaded The Southern Theater in Minneapolis this weekend, where they'll "follow the life cycle of a vacant lot." Aural: Relating to the ear. Hotbed: Any place that fosters rapid growth or development. Savage Aural Hotbed: A group of four middle-aged men who use boxes, springs, and auto parts in ways they weren't intended. On the set of their latest show, they've built a 10-foot scaffold and put a huge drum on top. It's actually a microwave dish, taken -- legally, they say -- from the top of the Pillsbury building. Savage Aural Hotbed distinguished itself in the mid-'90s by using unconventional instruments. Mark Black, one of the original members, says those big containers and industrial pipes change not only the band's sound, but also what it's like to watch them play. Just because something is intellectually complicated, like some of our strange rhythmic patterns, doesn't necessarily make it boring. "Some of our instruments are so big, you can't just stand and tippy-tap on it," says Black. "You have to stand back, and maybe even up on a box, get a good angle at it, and just use your whole body. There's a certain kind of thrill the audience can see when we're working so hard to do it." 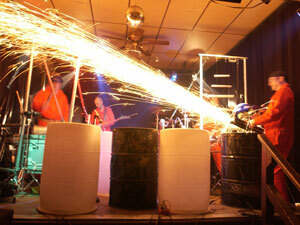 When the band plays arms fly, sparks shoot off the set, and fire courses through thick pipes. Plus, band member Dean Hawthorne admits, they're kind of loud. "No one forgets the first time they've seen us," he says. At first glance, Savage Aural Hotbed may just look like four guys pounding on things, but it's more complicated than that. The band's new show is actually about urban landscapes. Hawthorne says they're trying to capture the way buildings go up and down almost overnight. "At the top of the show, the stage is filled with stuff," says Hawthorne. "As the show moves along, the stage transforms and clears. The first act is more about that, and the second act is actually a little bit more about construction." The band calls the show, "The Rate of Mass Displacement is Momentum." If you give them a chance, they'll happily explain the math behind their complicated rhythms. Band member Stuart DeVaan will even try to define what they do. "We move the sound waves around the room here, we sculpt the air the way we want to sculpt the air. And if sculpting the air in a melodic or rhythmic way is music, then it's absolutely music," DeVaan says. All this may sound horribly heady, but really, this band is about having fun. In fact, sometimes these guys seem like 40 year-old kids playing in discarded garage-sale items, gleefully showing off their latest finds. Black says it's meant to be fun. "Just because something is intellectually complicated, like some of our strange rhythmic patterns, doesn't necessarily make it boring. We want to keep it exciting, too," Black says.